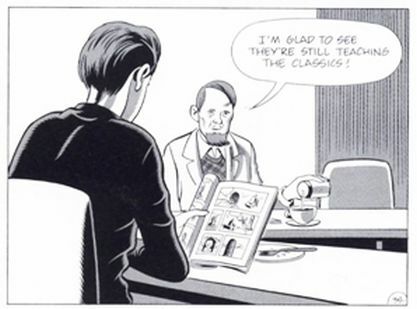 Fifteen years ago on February 1, 2001, my Daniel Clowes bibliography went online. I can trace its origin to an afternoon in 1999 when, wandering around Clemons Library in Charlottesville, Virginia, I said to myself, “I’m going to track down every single thing Clowes has ever done!” Having followed the cartoonist since 1987, I already had most of the comic books, graphic novels, and anthologies, along with a few OK Soda cans and Sub Pop LPs with his art, several magazine illustrations, and a Clowes original or two. But I had no idea how much stuff was out there, waiting to be unearthed, organized, and cataloged: dozens of magazine, comic-book, and zine covers; over 100 minicomics; tons of t-shirts; 45s with picture sleeves; Zippo lighters; comics in Cracked magazine under several pseudonyms; foreign editions and translations; prints and posters; a paddle ball; a board game; a watch; hand-painted ties; etc., etc., etc. After two years and around a thousand hours spent gathering information and buying stuff, I thought the bibliography was ready to go online. The site, whose updates since 2001 average 1.5 per month, includes over a dozen category-based lists in reverse chronological order with annotated entries (annotations typically include description, date of publication, contents, etc.). The bibliography has around 2000 entries for physical objects as well as things like online interviews with Clowes and magazine features about the cartoonist. Throughout the years, I’ve simplified the organization and compiled information into a few ‘user-friendly’ lists, such as an alphabetical cross-referenced list of stories in Clowes’s comics and collections, as well as a list of uncollected stories. (Bibliographic scholar and textual critic David Vander Meulen offered some helpful advice on restructuring the site’s contents and categories). Some folks have suggested I expand it into a visual archive, but I’ve decided to keep it simple and somewhat 'pure' — and adding images would be too much work. That, plus my limited ‘design skills’ explains why it looks the way it does: lines of black text on grey backgrounds. The bibliography, which first appeared on the University of Virginia’s American Studies site, is a fairly basic digital humanities project, but it serves its purpose. Many scholars and fans have told me they’ve used it when researching Clowes. Likewise, it's been essential in helping me to understand the vast scope of Clowes's work, informing the three books and many essays I've done on the cartoonist. But it also serves a different, more personal purpose. Such long-term pursuits keep me off the streets and out of trouble, providing my anxious, wandering mind with a sense of ‘direction.’ Since I’ve yet to track down everything Clowes has done, as I said I would in ’99, and since he's still producing excellent new work, there’s a reason to keep on keepin’ on.